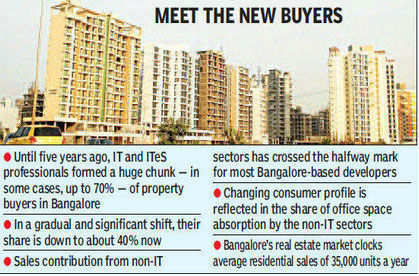 For Mantri Developers, non-IT professionals contribute 60% of its sales. Likewise, Shriram Properties, the real estate arm of the Shriram Group, said the revenue contribution of the non-IT sectors stands at about 55% now. "Just five years ago, the revenue contribution from the IT sector stood at 70%, which now stands at around 45%," said M Murali, MD, Shriram Properties. He added that sectors such as manufacturing, banking and financial services, automobile and aerospace are propelling the growth share of the non-IT segment. The changing consumer profile of the city's real estate market, which clocks average residential sales of 35,000 units a year, is reflected in the share of office space absorption by the non-IT sectors. A recent report by international property consultants Knight Frank showed the share of office space absorption by 'other sectors' (that includes pharmaceutical and healthcare, media, consulting and telecommunication) had expanded to 26% in the first half of this calendar year, from 11% in the same period a year ago. The share of IT/ITeS in office space absorption fell by four percentage points to 61% in the first half of this year. Sudeep Chandran, owner, Terrafirma Developers, has handled aerospace investments of Rs 100 crore in the past 18 months. Chandran said European seed research companies have drawn up expansion plans in the city, contributing to the growth in the number of non-IT jobs. If you look at the past couple of years, the wage growth in the IT industry hasn't been as spectacular as it was five years ago. On the contrary, the wage growth across most non-IT sectors has been good," said J C Sharma, MD, Sobha Developers. "The stability of the city's real estate market is because of this sectoral mix in buyer profile, with no one sector commanding a lion's share of the sales as was the case many years ago," said Venkat K Narayana, CFO, Prestige Group. As per industry data, while markets such as Mumbai and NCR struggled to post sales growth in the last fiscal, Bangalore's real estate market reported four straight quarters of sequential growth. BANGALORE:Sobha Developers Ltd’s profits are higher by 26.16 per cent at Rs 51.6 crore on a standalone basis for the second quarter of the financial year 2013-14 compared with the corresponding period last year (Rs 40.9 crore).